Good morning girls! Yesterday I went to Forte dei Marmi (Tuscany seaside) to enjoy the big opening of the new Pepita store. I’ll show you guys pictures of the event and I’ll show you more about Pepita energy this afternoon on the second post. In the meanwhile here the outfit I wore for the event. At the beginning the outfit would be created with high sandals and without jacket but the day has been rainy and so I changed my outfit with something feminine (the pink pants + the super funny Pepita tee) and something fierce like the leather jacket and the wedges. Let me know what do you think! Let’s talk in the afternoon, a big hug! Le scarpe sono qualcosa di orrendo ma il resto è molto carino! La tee è proprio carina!! e dolcissima con quel cagnolino! Wow, you look so pretty today!!! Perfect! bella fino alle caviglie…le scarpe sono terrificanti! Colore bellissimo, look grintoso e nello stesso tempo very charming! Complimenti!!! 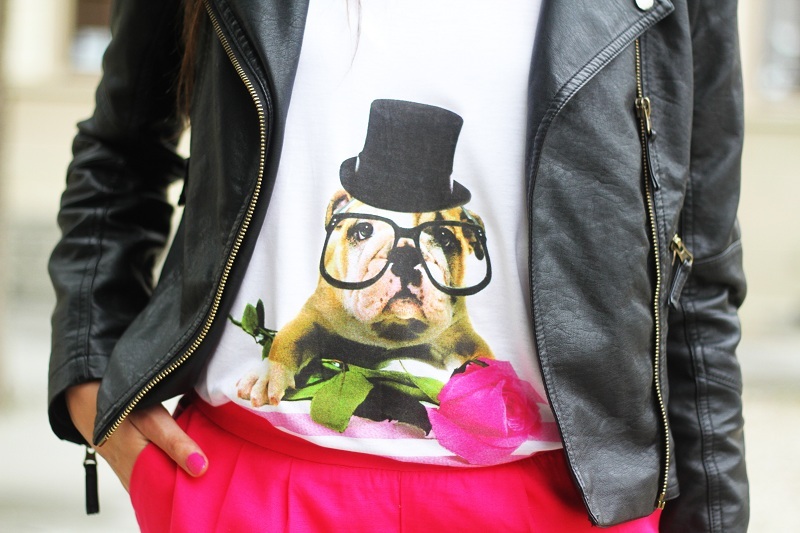 that is the cutest little puppy on your shirt! Love the pants! They look great on you! Grazie mille cara!! Un abbraccione! Grazie Marika!! :D Un abbraccio!! Grazie mille!! La matita ce l'avevo ugualmente ma molto leggera, poi ho messo una base di ombretto lievemente dorato per illuminare lo sguardo e il miracolo l'ha fatto il mascaro dior iconic.. strepitoso!!! Grazie Anonimo1! Oggi parrucchiere.. già tremo!! Grazie mille Anto!! Un abbraccio!! ogni tanto riguardo i tuoi vecchi outfits…amo questo!!!! <3 buona domenica!!! ogni tanto riguardo i tuoi vecchi outfits…questo è strepitoso!!! <3 buona domenica ire!